The Government has announced their intention to install the legendary children’s TV character Captain Scarlet as the new chief of Britain’s intelligence service MI6. The decision has received strong opposition from both the Liberal Democrats and the Conservative Party who branded it ‘highly controversial’ and ‘inappropriate’. The decision was defended by the Government; they explained they feel that Captain Scarlet is the ideal person to fill the position, of which the main responsibility would be the defence of the country against international terrorism. 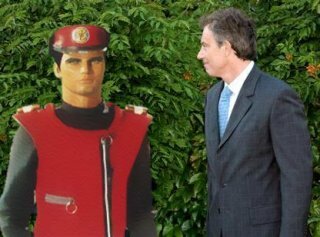 Prime Minister Tony Blair meets the new head of MI6 - Captain Scarlet. The Government highlighted Captain Scarlet’s extraordinary talents in dealing with the Mysterons, a hostile race of aliens from Mars and pointed out that their powers were far superior to Al Qaeda’s, especially when you considered they operated all the way from Mars. It turns out Mr Blair was initially against the appointment of Captain Scarlet when he was first considered for the position at the start of Labour’s first year in office back in 1997. However along with his change in opinions on the referendum for the European Constitution and the U-turn made on tuition fees, Mr Blair suddenly changed his mind and the appointment was made.